You can register through our website create username and password. If you have already registered then logon with username and password, close all links and open the website page again. Logon with the user name and password at the next page click on Poojan on request, at next page click on type Shardha Suman Vishesh Pooja or Individual Poojan at next click on Category at next enter details, click on submit. At the end it shows payment gateway you click on that, link will open the bank site you can enter credit card number, CVV number (at back side of credit card) and expiry date. If the bank will accept your credit card and the message appear for Non secure site you can click on yes. Your booking is completed. You can obtain the printout of said page. For check your booking you can logon with username and password at devotee zone it will shows all transactions which is successful. Otherwise booking is failure, you can check with your bank if your amount deducted please mail your transaction detail trace no., order no. or username and transaction date at online@maavaishnodevi.org . 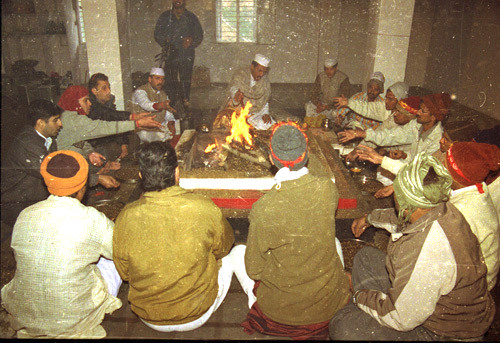 Pooja will be performed in the name of the person(s) for/by whom Pooja has been registered where the devotee(s) will not be sitting in the Pooja. Pooja can be booked for any day. The Prashad would be sent through courier to the given address. A maximum of five names of a family can be given for the purpose which shall be chanted during the course of the Pooja. The facility shall remain open for whole of the year. 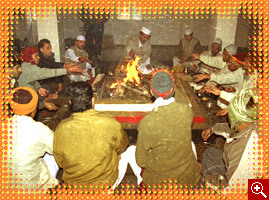 Pooja can be attended by the devotee himself/herself along with a maximum of four (total five) of his/her family members. Report before 08:00 am at room no.8 at Bhawan about the timings of the Pooja. Only advance booking will be allowed for this category of Poojan. Aarti Darshan (inside Holy Cave) for one Adult along with a child below ten years. One two bedded AC Room in Niharika. One two bedded room at Bhavan. Maximum of three meals for one adult and one child at Katra/Bhavan. Helicopter ticket/Battery Car ticket for one person. Aarti Darshan (inside Holy Cave) for two Adults along with two children below ten years. Maximum of three meals for two adult and two children to cost at Katra/Bhavan. Helicoper ticket/Battery Car ticket for two persons. Aarti Darshan (inside Holy Cave) for three Adults along with two children below ten years. One four bedded AC Room in Niharika. One four bedded room at Bhavan. Maximum of three meals for three adults and two children at Katra/Bhavan. Helicoper ticket/Battery Car ticket for three persons. Aarti Darshan (inside Holy Cave) for five adults alongwith two children below ten years. One four bedded AC Room and one two bedded AC Room in Niharika. One Four Bedded and One Two Bedded room at Bhavan. Maximum of three meals for five adults and two children at Katra/Bhavan. No refund shall be allowed. If after making payments Yatri is not interested the same shall be considered as donation. Change of dates can be accepted but only on next available slots. New dates should not be beyond one month of the date for which change request has been made. Change of Slots shall be accepted if this is intimated at least 48 hours in advance to the Manger Enquiry and reservation Shakti Bhawan Niharika, Katra at dm_enquiry@maavaishnodevi.net tel. 01991-234053. This poojan can be booked in advance. Spot booking is also allowed on current basis subject to the availability of slots. A maximum of two children (below ten years of age) will be accommodated free under B, C and D categories. One child (below ten years of age) will be accommodated free under category A. On occasion/festivals/Navratras Rs.35000/- per devotee will charge. Poojan once confirmed shall not be cancelled/postponed/preponed.